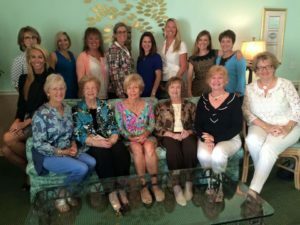 The seeds of the Junior League of the Palm Beaches (JLPB) were planted in early 1941 when 15 community-minded women established what was then called The Junior Welfare League. Members focused on supporting the war effort, as Palm Beach County hosted many WWII training bases, by hosting canteen events for soldiers and working with the Red Cross. Through the 1940’s the League also worked with the Rehabilitation Center for Children & Adults to assist their mission to provide therapy for polio and combat injury patients. Other volunteer initiatives provided support for Cerebral Palsy and The Girl Scouts. In 1950 JLPB began providing hearing conservation services, which has evolved into our legacy project, Eye & Ear Screening. In 1956 a thrift boutique was established to provide funding to expand projects, and our first group of League Sustainers were recognized. The first League Cotillion class was conducted in 1958. League funding and stewardship lead to the completion of the first wing of the Science Museum of South Florida in 1961; with that signature project, our organization was welcomed into the AJLI, to become known as the Junior League of the Palm Beaches. By 1964, a second wing and planetarium, dedicated by and named after NASA astronaut Buzz Aldrin, was also funded and built via JLPB efforts. Our first Junior League Cookbook, Palm Beach Entertains, was launched in 1976; members of the cookbook committee were featured on the cover of Town & Country magazine to promote the book. Through the 1980’s, JLPB pursued projects to assist the elderly, prevent substance abuse, worked with The Norton Museum and the Historical Society of Palm Beach County, and with other national AJLI national initiatives, such as Children’s Theater. After Hurricane Andrew devastated Miami-Dade County in 1992, JLPB members collected 20 pick up truck loads of needed relief supplies for the Miami community. Today, The Junior League of the Palm Beaches 75 + year legacy of service endures and grows. JLPB has published three celebrated cookbooks, provides thousands of volunteer hours, and awards annual mini-grants to community programs. Our members serve on numerous non-profit boards. Major projects over time have included the establishment and building of Quantum House and the 10,000 sq. foot Fun Zone play area in Gaines Park, while significant fundraisers have included the Designer’s Show House at the Vanderbilt Mansion, the original Festival of Trees, the Women Volunteer of the Year Awards Luncheon, Worth Tasting on Worth Avenue, as well as our current signature fundraiser Deck the Palms Holiday Market. Our League has worked with many community partners such as Vita Nova, Nelle Smith Residence, St. Mary’s Hospital, Mounts Botanical Garden, Sun Fest, Susan G. Komen Race for the Cure, the Palm Beach County History Museum, and the Ann Norton Sculpture Garden, to continue our legacy of volunteerism and to serve with a focus on children’s wellness and welfare in the Palm Beach County community. Take a walk through our JLPB History through the eyes of our Past Presidents. Click on any of the decade links below.